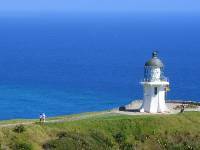 Had the most fantastic day trip to Cape Reinga. A highlight had to be our driver Alto who to be honest I cant really describe. He was like a hyperactive comedian with ADHD. He never stopped. Incedently, the drivers here are the tour guides - they do both. On the way up we stopped at a forest to see some native Kauri trees, some of the biggest trees in New Zealand. Next stop was the lighthouse right at the most northernly point, where the Pacific Ocean meets the Tasman sea. It was stunning up there, lush green hills, white sand and blue sea and sky. We moved on to the sand dunes to do a spot of sandboarding on an 85 metre dune. This time we had no sand buggies and had to climb to the top- have you ever tried walking uphill on sand? Its impossible, talk about two steps forward, one step back. We boarded down on body boards this time without my camera! was a right laugh. We drove on down a road, which in most other countries would be called a quicksand bottomed stream!. It took a great deal of skill to drive on these conditions, the main one being not to stop - Even if a group of OAPs are in the way. It was hillarious. Basically this group of Saga holidaymakers were standing on the 'road' taking photos. Not being able to stop the driver beeped his horn. They still didnt move. He beeped again. Realising the bus wasnt going to stop they started to 'scamper' out of the way....Not far enough in time. The spray splashed up from the tyres all over their disbelieving faces. We continued on to one of the main highways. Again not really a highway to you and me. this time it was a ninety mile beach - called ninety mile beach- the kiwis are pretty to the point when it comes to naming stuff. The beach is a renouned car trap - we saw two bogged wehicles onour short journey. It was strange to be driving down a beach on a bus, dodging seagulls. As far as the eye could see was just beach. On the way back we stoped at a fruit and veg stall. Theyre really good at encouraging their own produce here. we bought some corn on the cobs for a BBQ tonight and it had to be the best sweetcorn i've ever tasted. We drove back to Paihi listening in amusement to Alto's ceaseless banter.